Hello there, have you heard the news? 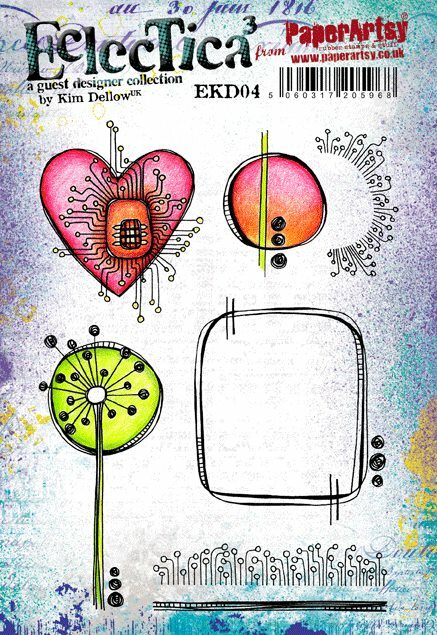 The amazing Kim Dellow has a new release of fabulous stamps and stencils out for PaperArtsy this month. Kim kindly asked me to be one of her Wingmen for the release and along with Anneke (the other Wingman), we are joining Kim creating samples using the new products. Kim is releasing three new stamps sets, along with three new stencils/masks with a floral theme. 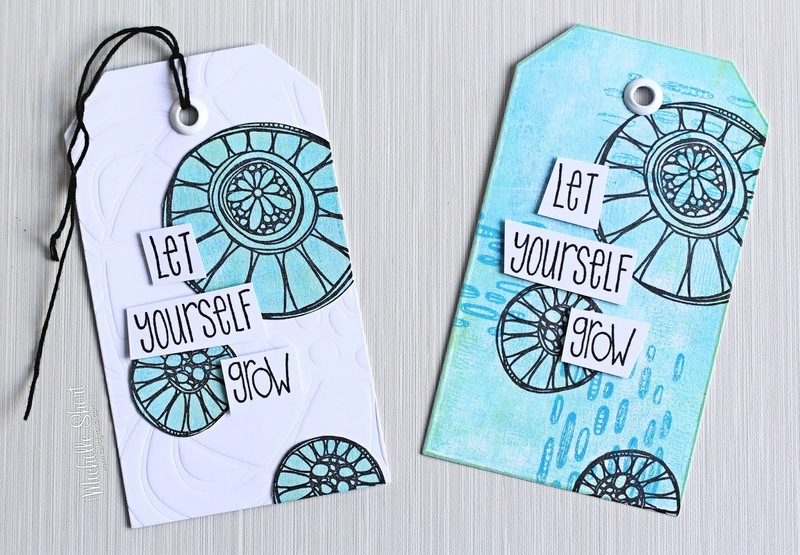 PaperArtsy definitely has a more artsy/mix media feel to their products but I wanted to show you that you can create clean and simple projects (if that is what you would like to do!) with them as well. I had great fun creating with the stamps, stencils and paints. Today I am sharing snippets of all the projects I made with the new release and then throughout the following days, I will go in depth with each project sharing all of the supplies I used. My first card uses the new EKD04 stamp set. It's a wonderful set filled with different shaped images that work really well the other stamp sets being released, but can be used on it's own too. 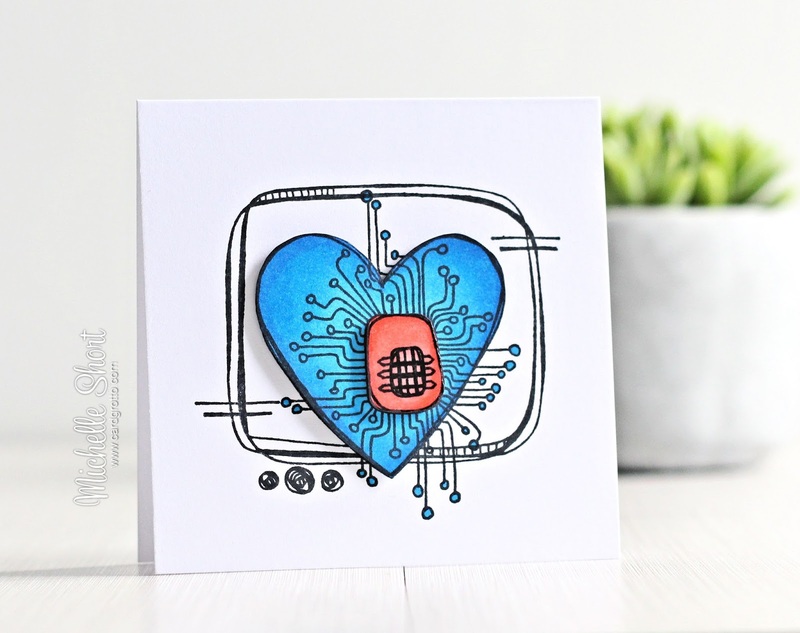 The rectangle image and heart image are two separate stamps that I layered up to create a little notecard. I love Kim's line work! My second card uses the new EKD05 stamp set. How gorgeous is that butterfly?! The set also has some beautiful floral images in it as well as some great shape images. Can you see the embossing in the background? That was created with one of Kim's new stencils. PS048 has four gorgeous images in the set. Three flowers and one leaf image. These actually are masks, rather than stencils and are excellent quality. As you can see, it embossed really well using my die cutting machine. 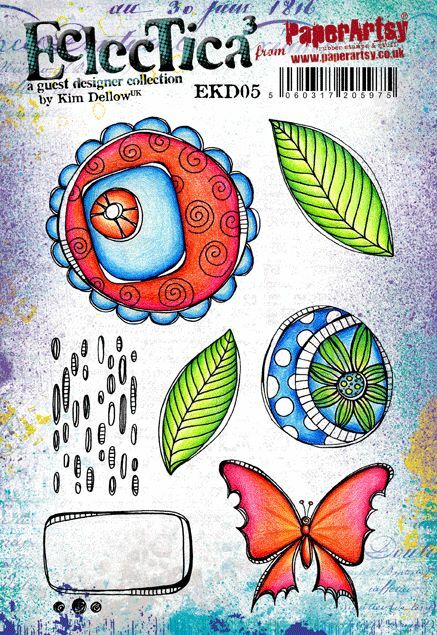 My next card uses the amazing new EKD06 stamp set for the large flower and the EKD05 for the leaves. EKD06 has the same floral theme, filled with gorgeous flowers and leaves in Kim's unique line art style. I love it! The last of my projects uses the graphic images from the EKD06 stamp set. 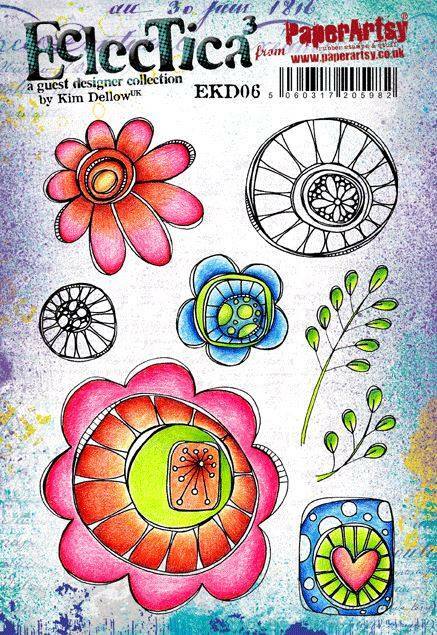 They look like flowers to me but can be simple circle images too. I love the versatility of Kim's sets! The tag on the left also uses the new PS046 stencil, again I have embossed with it as I love the look. The tags also use the PaperArtsy Fresco Finish paints in Kim's colour palette - they are gorgeous! 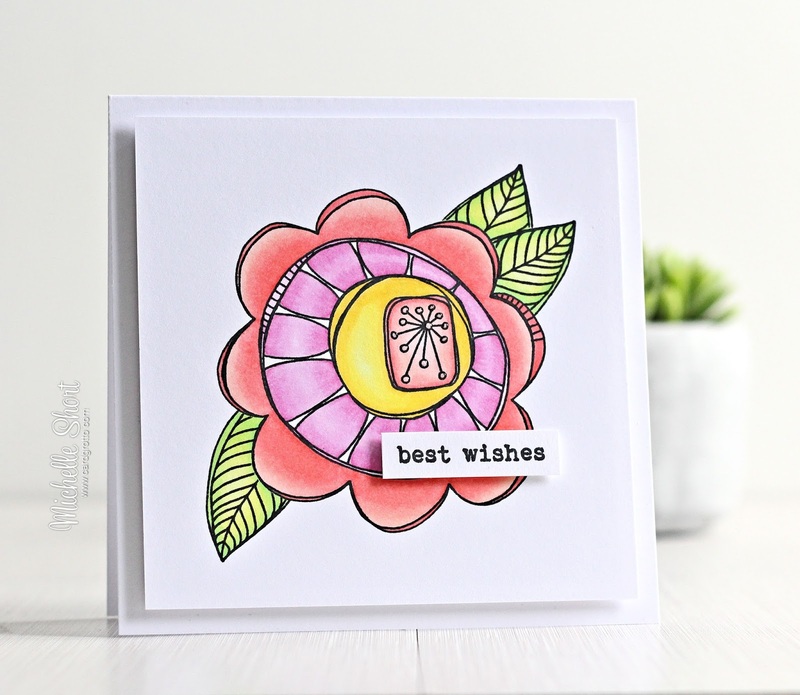 You can find out all of the information on the release over on Kim's Blog as well as the PaperArtsy blog. 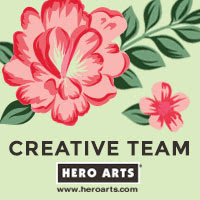 Here is a video from PaperArtsy sharing all of the samples created for the release. As you can see, my cards are more on the clean and simple side but you can do amazing things with different media too! (My projects have been matted in the video so that all the samples work together across the PaperArtsy line). Please do pop back throughout the next few days for the details on the projects I shared. Thank you so much for visiting me today. I hope you have a great rest of the day! 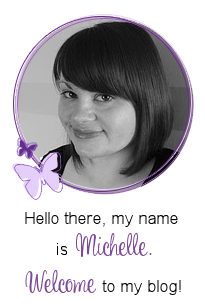 Your samples look gorgeous Michelle! I have to try the embossing technique with the masks, love the effect! Very inspiring blogpost! So beautiful...love all your wonderful cards and those stamps are amazing.